Smart and adaptable accommodation between Leazes Park, Heaton Park and Jesmond. Holiday Inn fills a gap in affordable accommodation on the north side of the city. You certainly can't fault the location; not only is it situated in one of the most fashionable and vibrant areas of the city, you have Newcastle University a few hundred yards to the west of it, the University of Northumbria a few minutes to the south of it and Armstrong and Heaton Park to the East of it. You also have excellent access to the A167 and Newcastle Metro Centre. Newcastle International Airport is only 10 minutes away too – which means it’s perfect for jetting off to those sunny far-off shores beyond the Tyne. Lot's to talk about here. 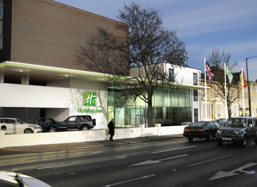 The Holiday Inn enjoys a street-side Italian restaurant called ‘Fratellos’, a stylish Terrace Bar and the rooms feature wireless iPod docks and a TV that allows you to save programmes for a time that suits you. Newcastle's Great North Museum is worth a visit. It's a family-friendly attraction, just 10 minutes' walk from the express holiday inn. Exhibits include interactive model of Hadrian's Wall and a T-Rex skeleton.